Check out this 3 bedroom, 2 bathroom manufactured home on a certified permanent foundation. This 1,188 square foot estate is located in the Cedar Creek Terrace Subdivision on 1.045 acres on a treed, level lot. The area is full of nice homes and there are some restrictive covenants. You can expect a propane forced air furnace, nice sized kitchen with an island and tons of storage space. There is plenty of room on the property to build a decent garage or workshop. HOA dues are $200 per year for road maintenance. Approximately 1 ½ miles from Superior city limits and just a drive away from Cedar Creek, the Clark Fork River, the Cedar Creek Golf Course, schools, Lolo National Forest and Lolo Hot Springs! Call Bessie at Spangler Real Estate for more information or to schedule a showing at 406-822-4415. 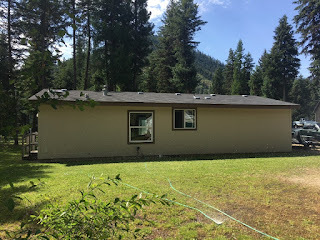 #340 Terrace Court Superior, MT 59872. Priced at $165,000.